Guess what we’ve been doing this summer? 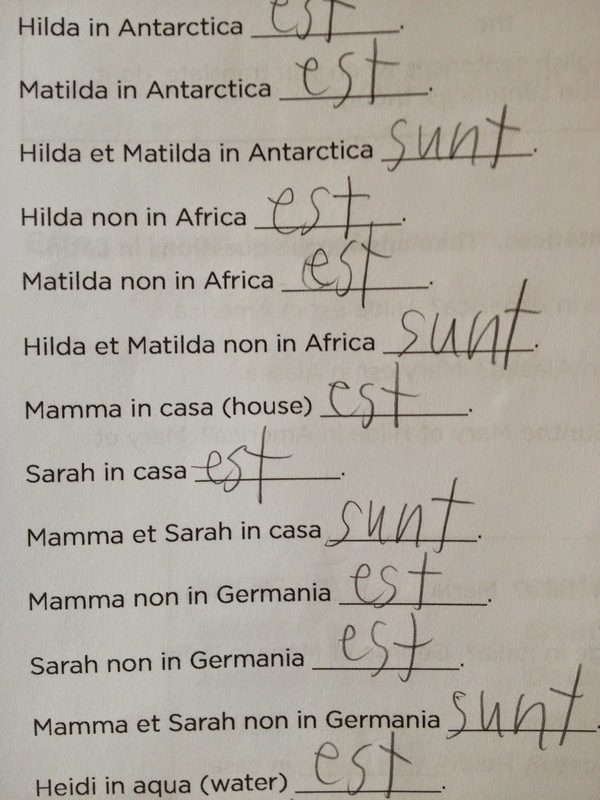 We’ve been learning some Latin. No summer brain drain here!!!! We had the chance to review Visual Latin I from Roman Roads Media. Roman Roads Media publishes video-based courses for the homeschool. Their courses are rooted in classical education and taught from a Christian perspective. They use master teachers to create courses in history, poetry, Latin, economics, music, and logic. 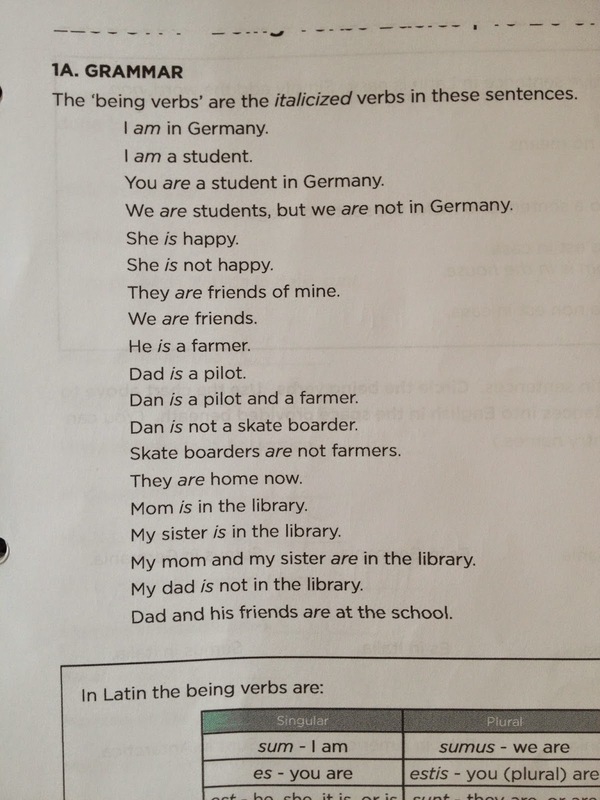 Visual Latin I is a first-year Latin program for children in grades 4 and older. The course is taught by a veteran Latin teacher named Dwane Thomas who is enthusiastic about Latin and a little quirky in a fun way. The course contains 30 lessons. Each lesson has 3 separate video segments of less than 10 minutes each. There is also a downloadable worksheet for each video segment which provides practice to reinforce the concepts. I received the download of Visual Latin I which included all the videos for the 30 lessons as well as the workbook pages in printable form and the answer key. Visual Latin I and II are geared for grades 4th and up. However, Curly is strong in grammar and loves to read and write. So, I felt that she would be able to understand the Latin concepts. And I was right! When we first began the program we covered about two lessons per week. We watched the lessons together and I sat nearby as Curly did her homework. I kept the answer key handy for me so I could make sure she wasn’t making any mistakes as she completed her practice pages. After about the 5th or 6th lessons, we had to slow down our pace and only complete 1 lesson per week because of the amount of material introduced. The concepts started off at a good and understandable pace but quickly picked up in content and difficulty. Sometimes we even watched videos several times to make sure we understood the concepts. Once we hit our stride with this program, we were doing Latin 3 days per week, watching 1 video segment per day and completing the practice worksheet. On the other days we often re-watched one of the videos, especially the videos of the Latin readings so we could practice our pronunciation. I took some Latin in highschool (but much of what I learned was long forgotten) and Curly has had zero Latin exposure. Despite our limited Latin background, we were able to jump into the first lesson together with no problem. We’ve both been following along just fine and learning as we go. I was so thankful that it starts at a level where we could begin with no background and move forward at our own pace. The teacher was a little quirky but was fun and funny. Curly was often laughing at his corny jokes and enjoying his silly antics (like when he pretends to talk on his cell phone). Dwane made Latin seem approachable and interesting. He even threw in fun sentences about things like ninjas. He made Latin accessible and I really appreciated his laid back and informal approach. Throughout the lesson, you receive instruction in not only Latin grammar, but learn about English grammar as well. Dwane also introduced facts of Roman history in some lessons. It felt like more than just a Latin program as we learned tidbits about root words, history, and our own language’s structure. The short lessons were just long enough for us to learn a new concept and receive some practice without feeling overwhelmed. Because the lessons were short it was easy to watch them multiple times when we needed more reinforcement of a concept. I appreciated the short length of the lessons, especially for a younger student with no Latin background. I think if the videos had been longer or if the teacher had attempted to teach more than one topic per video we would have become too overwhelmed to continue. So, the pacing was perfect for us with only one concept taught in each video segment. I loved the organization of the program. Each lesson has 3 identical sections that built upon each other. The first portion introduces the grammar concepts. Often the Latin grammar concepts were taught alongside the same English grammar topic to help with understanding. The next section required us to put our knowledge into practice with sentences, choosing the correct verb tense or the proper adjective. The last section was probably my favorite. It was exciting to hear the Bible read in Latin and then try to translate the sections afterward. This section required us to use the grammar concepts we had learned and also remember new vocabulary. 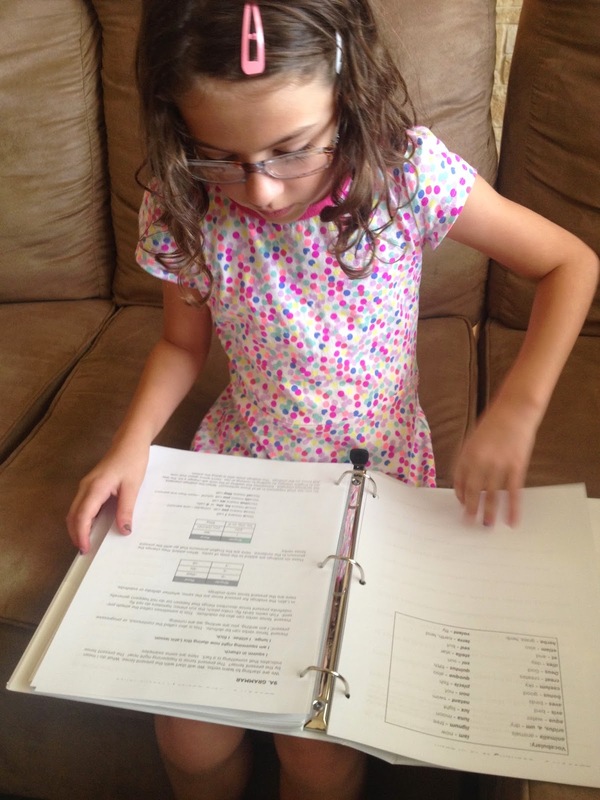 Curly enjoyed the worksheets and they provided much needed practice for the concepts. However, I felt there could have been more practice. I would have liked some additional worksheets. But what I think this program needs is more review. The worksheets mostly contain practice for the current lesson topic and do not add in questions and sentences that review previous topics. While the program does build on itself in the topics taught, I know that both Curly and I would have benefited from a more systematic review process so that we would not forget previously learned conjugations or grammar rules. 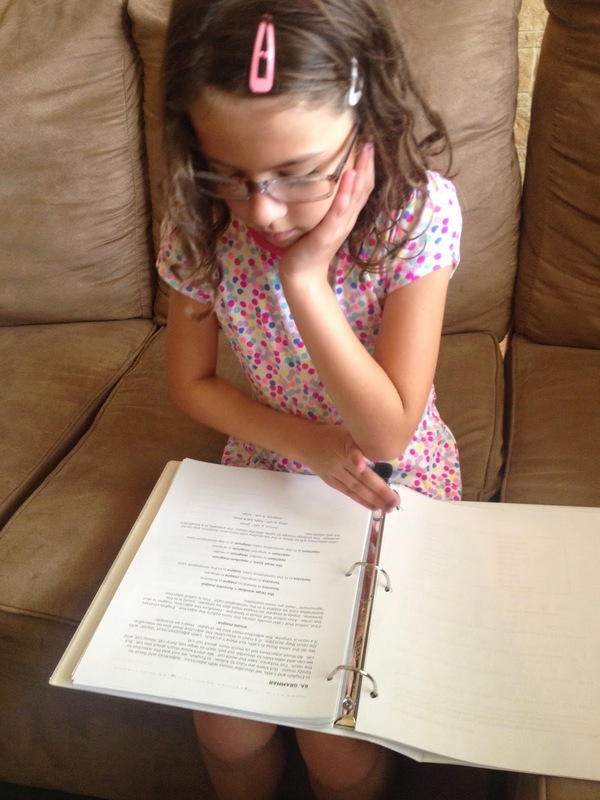 The worksheets are an integral part of the program. While most of the concepts are taught in the video. There were a few times when a worksheet added new information to the lesson topic. In these cases I was glad that we completed the worksheets together so that we both understood and applied the additional information. After we listened to the readings from the Latin Vulgate, Curly worked to translate the passages. 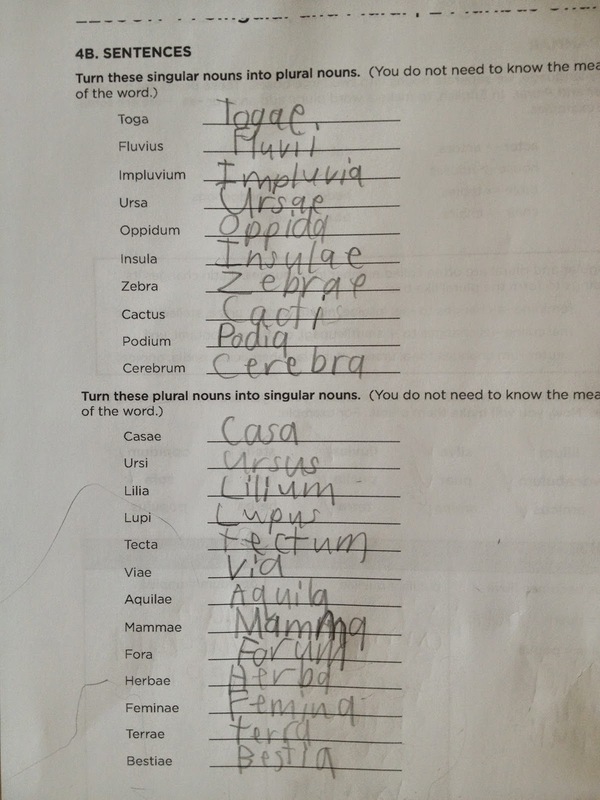 At the bottom of the page there was a vocabulary box with the meaning of new Latin vocabulary words. This was helpful as she translated. However, there were times when we encountered a new word that was not listed at the bottom of the page. There was once or twice that I had to consult the answer key to make sure that we understood the meaning. Because I had the answer key, it wasn’t too frustrating. However, I thought they might need to go back through all the vocabulary words and make sure the words in the reading section were previously introduced or ensure that they were included in the vocabulary sections. We have loved this visual and engaging Latin course for beginners. It has proven to be a thorough and challenging course that is also fun. Overall, this has been a great starting point for us in learning Latin! We plan to continue this program throughout the year as we learn Latin together. I think we’ll even move on to the second level next year. I have been so impressed! Now I want Visual Spanish, Visual French, and Visual German! Is that too much to ask? I would recommend that the student have a solid background in English grammar (understanding all the parts of speech and verb tenses) before beginning this program. To understand the Latin grammar it helps to be very clear on the rules of English grammar. And because we have enjoyed Visual Latin so much, I spent some time checking out the other programs that are offered. I know that we will absolutely have to look into the American History course as well as the courses of Old Western Culture. My husband was even interested in the economics class! We’ll have to wait for when our kids are a little older but these are now on my wishlist!